David traveled to Seoul, South Korea in October to speak at multiple conferences. On October 11, he spoke at Transition City Seoul, hosted by the Metropolitan Government and organized by the Seoul Institute – “Transition to An Ecological Civilization: The Role of the City“. On January 30, 2017, David delivered the keynote address – “A Living Earth Economy for an Ecological Civilization” – at International Week at the University of Alberta in Edmonton, hosted by the Global Education Program. The full text of his presentation and a link to the printer-friendly PDF are available HERE. The broadcast version is available from Alternative Radio. On July 7, David presented “Change the Story, Change the Future” at the 2016 Chautauqua Summer Institute. Ironically, he delivered this talk following a presentation by Steve Forbes, the editor-in-chief of Forbes magazine, an ideal opportunity to compare and contrast ideas. Watch the video and follow with an article by Jason Mast in The Chautauqua Daily. From the full-day Spring of Sustainability Earth Day telesummit: “Living Earth, Living Universe“, a conversation between David Korten and Duane Elgin on April 22. Experiencing both the Earth and the Universe as living systems (of which we are a part) has huge implications for knowing who we are and what we are here to do. This is an exploration by two thought-leaders which helped set the tone for the 9-week Spring of Sustainability series, “Turning Crises into Creative Solutions”. On the first day (April 28, 2014) of the 9-week Spring of Sustainability series “Turning Crises into Creative Solutions”, David Korten and Bill Twist, co-founder and CEO of The Pachamama Alliance, talk about “Living Earth and the Human Presence Upon It“. Sacred Earth, a New Economy, and the 21st Century University. “New Economy Summit,” University of British Colombia, April 4, 2013. The complicity of 20th century universities in leading humanity into a 21st century crisis and the importance of an emerging student movement demanding and providing intellectual leadership for an essential transformation of higher education. To download in pdf format. Religion, Science, and Spirit: A Sacred Story for Our Time. February 2, 2013 afternoon presentation to the GATE Transformational Story Conference. These two presentations are variations on the same theme. The afternoon session presentation highlights a distinction between individual and collective self-discovery brings in examples of self-organization from the biosphere and the human body. The evening session presentation builds on David’s personal story of how he came to realize that failed economic systems are products of failed stories. Religion, Science, and Spirit: A Sacred Story for Our Time. February 2, 2013 evening presentation to 1,500 Hollywood artists and story tellers at the Global Alliance for Transformational Media – GATE 3 conference evening program “Celebrating Meaningful Messages for an Awakening Humanity.” Based on the essay of the same name. 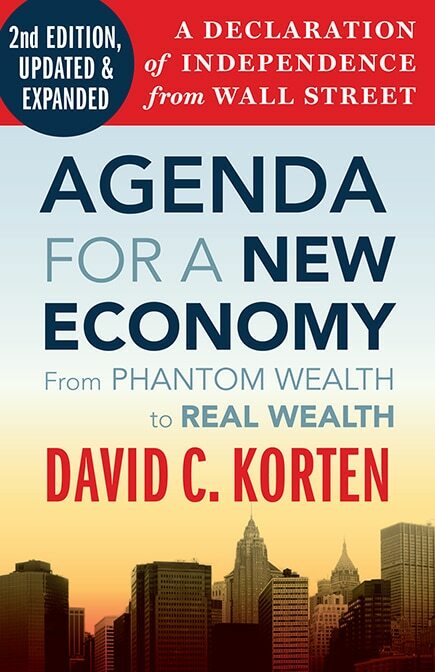 Agenda for a New Economy. October 5, 2011 inaugural lecture for the University of Oregon Wayne Morse Center for Law and Politics 2011-2013 inquiry “From Wall Street to Main Street: Capitalism and the Common Good.” This lecture frames the two year inquiry in relation to the New Economy agenda and connects it to the National Occupy Wall Street resistance movement. Listen to the Alternative Radio broadcast. How to Liberate America. September 28, 2011 Keynote presentation to the Move On Olympic Progressive gathering that launched the American Dream movement on the Olympic Peninsula. Makes the case that we build effective political power only through larger alliances built around unifying stories and suggests that an epic contest between Wall Street and Main Street economies for the soul of America may provide the needed story for a broadly based progressive political alliance. Agenda for a Green Economy. Keynote presentation to the 2011 Green Party National Conference suggesting a framing message and strategy for Green Party USA. Taking Ecological Economics Seriously: Its the Biosphere Stupid. Keynote presentation to the 2011 US Society for Ecological Economics (USSEE). A challenge to ecological economists to replace the prevailing suicide economics with a new economics devoted to developing and popularizing the theoretical frameworks and policy tools required to reorganize and manage human relationships with the biosphere. Follow the Money. Presentation to the Seattle Green Festival 2011, May 21, 2011. Addresses the role of money in separating humans from one another and nature and outlines how the money/banking system can be redesigned to support our reconnection. A New Economy, a Spiritual Awakening, and a Prophetic Mission. Presentation to the Interfaith New Economy Planning Group meeting sponsored by the Rauschenbusch Center, The Church Council of Greater Seattle, January 28, 2011 to initiate a Seattle interfaith conversation about the role of faith institutions in addressing the economic dimension of the unfolding economic, social, environmental, and political crisis. The Green Party and the New Economy. A challenge to a November 13, 2010 gathering of Green Party leaders from the Pacific Northwest to make the Green Party the most significant political force in America by rethinking and repositioning itself as the political arm of a powerful and growing social movement. The Great Turning and the New Economy: Wall Street, Community, and You. Whidbey Island Bioneers, October 13, 2010 Keynote. Script for a 3 minute video animation in production by my daughter Diana Korten for distribution in late 2010. The keynote address for the Business Alliance for Local Living Economies (BALLE) in Charleston, NC on May 22, 2010. Address to the Education for Sustainable Development Conference, Stockholm, Sweden, January 29, 2010. Outlines an ambitious agenda for restructuring institutions of higher learning to address the challenges of the 21st century. Address to the European Union Club of Rome, Brussels, Belgium, January 26, 2010. Presents a challenge to the Club of Rome to participate in creating an economic vision for the 21st century equal to the challenge of addressing the crisis of the human confrontation with planetary limits that the Club or Rome brought to the fore of human consciousness with its historic 1972 report on The Limits to Growth. Presentation to Economics of Peace Conference in Sonoma, CA October 19, 2009 sponsored by Praxis Peace Institute & RSF Social Finance. Presentation to BALLE National Conference May 23, 2009 in Denver on the Plenary Panel on Public Policy. Outlines policies to shift the balance from favoring Wall Street to favoring Main Street. Presentation to BALLE National Conference May 22, 2009 in Denver to the BALLE 101 breakout session. Presents the big picture framing of the BALLE mission as part of the conference orientation for new members. This is the presentation delivered at the Wall Street Trinity Episcopal Church on January 23, 2009 to the Trinity Institute 39th National Theological Conference on “Radical Abundance: A Theology of Sustainability.” You may view the video version at the bottom of the home page of this website. It was subsequently published by Tikkun Magazine. Presentation to the Consumer Cooperatives Management Association, Portland, OR, June 13, 2008. 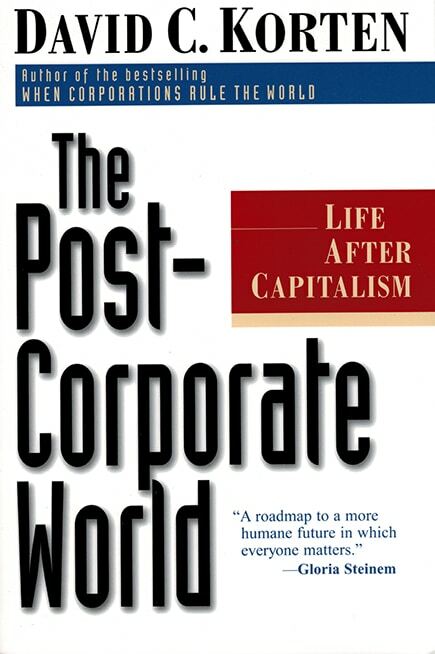 Explores the essential role of the cooperatives movement in creating a new economy for the world we want and the world we must bring forth if there is to be a human future. Equitable, democratic participation in ownership is key and the cooperatives movement is a primary repository of essential experience and expertise. A public conversation between Joanna Macy and David Korten on the Great Turning at the Seattle Unity Church before 450 people on May 25, 2008. The event was organized by For the Grandchildren and moderated by Victor Bremson. Eco-philosopher Joanna Macy, Ph.D., is a scholar of Buddhism, general systems theory, and deep ecology. A respected voice in movements for peace, justice, and ecology, she interweaves her scholarship with four decades of activism. Joanna framed and popularized the term the Great Turning. She is a popular speaker and workshop leader as well as the author of numerous books, including World as Lover, World as Self; Coming Back to Life: Practices to Reconnect Our Lives, Our World; and In Praise of Mortality. Available in audio only. Sermon delivered by David Korten to the Quimper Unitarian Universalist Fllowship, Port Townsend, WA, January 27, 2008. This is a short version of the basic great turning story with a focus on three contrasting meaning stories that frame very different understandings of our human nature and place in creation. David Korten’s presentation to the Summit on the Future of Corporations, Faneuil Hall, Boston MA, November 13, 2007. Faneuil Hall, Boston, MA, November 13, 2007. 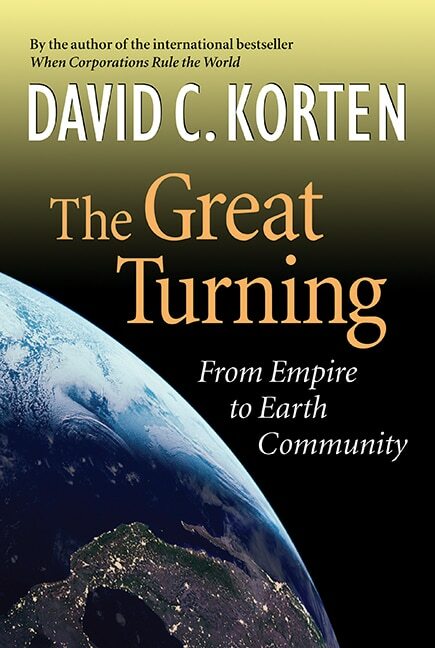 On June 14, 2006, David delivered this presentation to a gathering hosted by the Unitarian Church of All Souls in NYC, following the launch of his book, The Great Turning. He makes the case that we humans are a choice making species that, at this defining moment, faces both the opportunity and the imperative to choose our future as a conscious collective act. We can no longer deny the need nor delay our response. Remarks by David Korten in Dialogue with Cynthia Moe-Lobeda, Rauschenbusch Center Annual Dinner, November 12, 2004, University Congregational Church, Seattle. With Follow-on Remarks at University Baptist Church Brunch. Examines the challenge facing mainstream Christians in the light of role of the Christian Right in electing an administration dedicated to policies in sharp conflict with moral teachings of Jesus, who opposed Empire and called his followers to create a world of peace and justice. Closing keynote, 2nd Annual Conference of the Business Alliance for Local Living Economies (BALLE), May 23, 2004, Philadelphia. In 1776 America’s founders met in Philadelphia to articulate a vision of the possibility of self-rule by all people and initiated a great social experiment dedicated to its realization. As a nation we have made substantial progress toward realizing that vision through a long and difficult struggle by the people to whom it held out a great promise. As the policies of the current administration remind us, however, much work remains. We meet in this same city of Philadelphia to renew the vision and carry forward the work of economic transformation essential to its realization. The presentation explores what this means for BALLE. 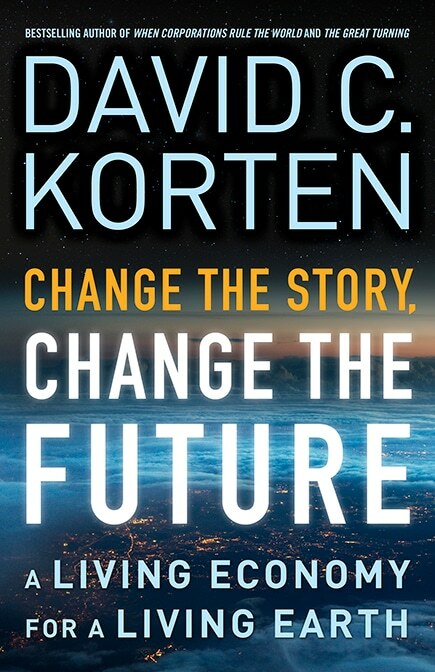 Keynote presentation by David C. Korten to the Twenty-Fifth Prairie Festival, The Land Institute, Salina, Kansas, September 26-28, 2003. The transformation of an increasingly destructive corporate industrial agriculture is an essential foundation of the human step from a 5,000 year Era of Empire to a new Era of Earth Community. March 21, 2003. “Now that War has Started: What Role for the Peace Movement?” Following the initiation of the second Iraq war, citizens gathered in peace vigils across America and the world. This is a statement presented to the vigil held in Seattle at the Federal Building on the second full day of the war. SVN Living Economies Presentation to the Social Ventures Network Annual Fall Conference, El Capitan Canyon, Santa Barbara, CA, October 10-13,2002. Outlines how the SVN living economies initiative takes business responsibility to a new level and places it in an evolutionary perspective of the critical choices now facing the human species between American empire and Earth democracy. One of the SVN presentations that shaped the formation of the Business Alliance for Local Livng Economies. Keynote address to Global 6 Billion People’s Summit, University of Calgary, June 22, 2002. Names three issues citizens groups will be addressing in Calgary that the G8 will not address: the threat of official terrorism, why growth is an agenda of the rich, and the need of African’s for greater control of their own economies. Presents a strategy for replacing the global suicide economy with a planetary system of local living economies. From the Love of Money to the Love of Life. September 29, 2001. Keynote Address at the U.S. launch of the Earth Charter at the First Annual U.S. Earth Charter Community Summit in Tampa, Florida. The tragic events of September 11, 2001 bring into focus the choice for America and humanity between escalating violence and undertaking the Great Work of an inclusive Earth Community based on the framing values and principles of the Earth Charter. Investing in Planetary Health and Human Survival: Does it meet the test of the prudent person? Keynote Address to SRI in the Rockies Conference, October 5, 2000, Snow Mass Resort, Aspen, CO. 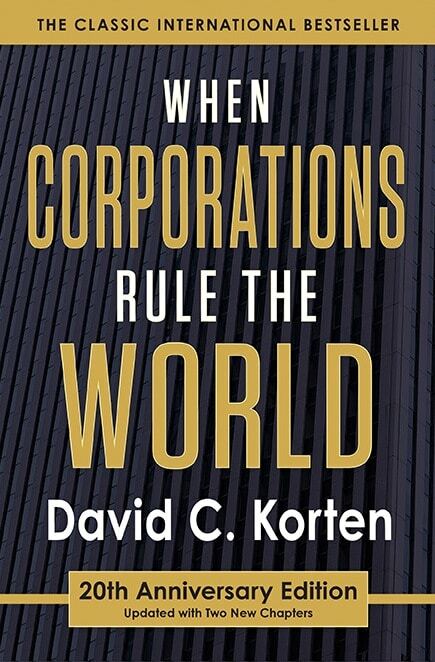 Examines the deeper issues of social investing in a world of corporate rule, highlighting the conflict between the prudent person rule for institutional investors and needs of planetary health and human survival. “One World — One Governance System: UN Yes! Bretton Woods No!” Presentation by David C. Korten at the IFG New York/ United Nations Summit Teach-In, September 5, 2000. Lays out the proposed framework then being developed by the International Forum on Globalization for restructuring the institutions of global governance. Presentation made during speaking tour of Alberta and Saskatchewan Provinces in Canada, November 1998. The relationship of capitalism to the market and democracy is much like that of a cancer to the body. Capitalism is killing people, community, and the biosphere. Democracy and healthy market economies are the cure. This presentation is available on broadcast audio tape from Alternative Radio. 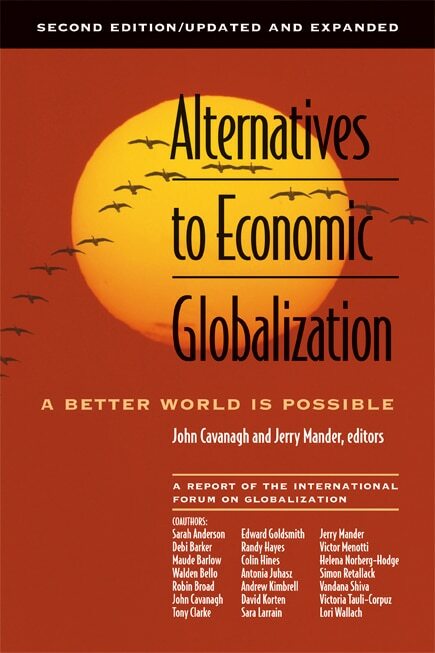 Presentation to the Bellerive/GLOBE International Conference on Policing the Global Economy, Geneva, March 23-25, 1998 organized by Prince Sadruddin Aga Khan to bring together leading proponents and critics of economic globalization. This paper presents a case for closing the WTO to protect democracy and real markets.